Learning Toolbox as an ePoster solution is a spin-off initiative that emerged from the EU- funded Learning Layers research & development project. 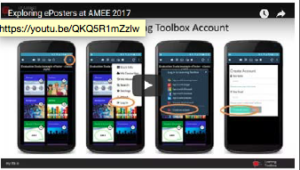 AMEE 2017 has been the pioneering ePoster client. AMEE is the very large (approx. 3,800 delegates) annual international conference of the Association of Medical Education (AMEE). 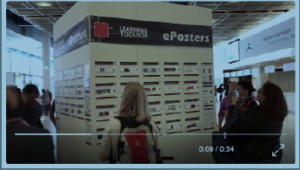 These two short videos (which were created for the conference participants) provide an overview of the how the ePosters worked at AMEE. What is novel about Learning Toolbox? We wanted to move beyond a vision of ePosters as just an onscreen version of a paper poster (most ePoster solutions are effectively online PDFs with minimal interactivity). 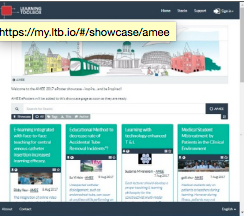 Learning Toolbox allows people to include a wide range of multimedia and interactive material in their ePoster including videos, surveys, presentations, web links and even apps. We wanted to give the ePosters both a physical and virtual presence at the conference, and to allow easy bridging between these worlds. Existing ePoster platforms often only offer the ePosters online, so that they are easily overlooked in busy conferences. We used the mini-poster wall to actually give the ePosters a high profile (but small footprint) presence in the conference and a very easy way to move from the mini-poster to the ePosters. We wanted to support people engaging with the ePoster work and the ePoster authors (with traditional posters & ePosters this interaction with the author is only really possible during a very short timetabled presentation session). So Learning Toolbox also allows people to have discussions that are attached to the ePoster (viewable by all who interact with that ePoster) and the ePoster author can also send out messages to the ePoster. These exchanges can happen before, during & after the conference. Our educational aim is for this extra interactivity to help people to find and develop groups who have a shared interest in their research topic. This can be a particular issue at large conferences such as AMEE. We wanted to help people to feel very connected to the ePosters, to have them in their hands, in their pocket. You can also easily share an ePoster from one phone to another, allowing people to pass on the ePosters that interest them. Many traditional ePoster solutions rely heavily on expensive hardware (large screens or touchscreens). Learning Toolbox instead uses people’s own devices, supporting a more personalised experience. As I have heard it from Gilbert Peffer, who was also involved in that exercise, also other conferences and support organisations are interested to use ePosters. We hope that also our conference organisers in the field of Vocational Education and Training (VET) research will follow their example in due time. 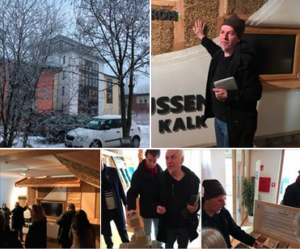 After the final review of our EU-funded Learning Layers (LL) project (see my blogs from January and February) I have tried to report on the follow-up activities in North Germany and with our partners in construction sector. 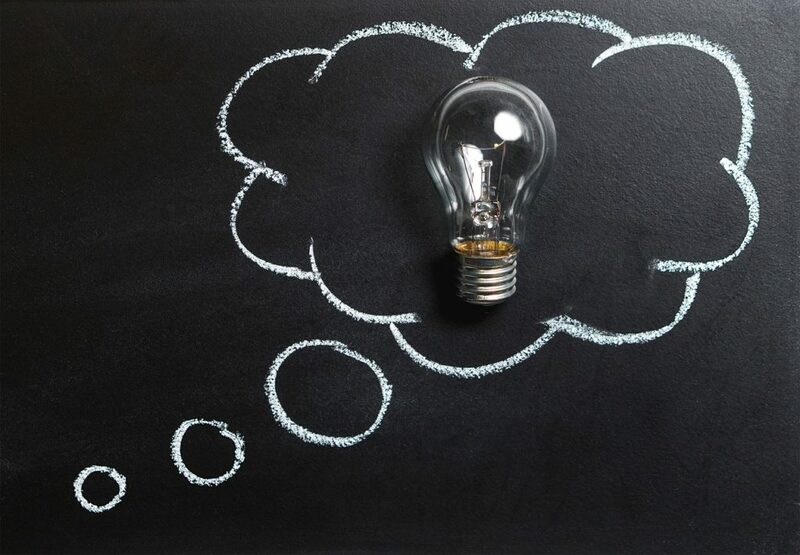 In my blogs in March, April and May I have reported on ongoing projects or new initiatives in which the use of Learning Toolbox (LTB) has played an important role. As these blogs have been based on particular meetings or workshops, the picture may have remained somewhat fragmentary. However, this week we have had a series of meetings with different counterparts. This has made it possible to create a group picture of ongoing activities. Below I will report on the discussions in the three first meetings of this week in which I was present. Here it is worthwhile to note that none of these meetings was focusing only on specific uses of LTB as a dedicated tool for certain uses. Instead, all these meetings were discussing more comprehensive ecosystems of knowledge processes and software solutions (Ökosysteme für Wissensvermittlung und Software-Lösungen). In this context our counterparts were looking for different roles for LTB – as a part of an integrative software ecosystem – in promoting learning, training and workin in construction sector. In the meeting in Bau-ABC we discussed the prospects of developing an integrative software ecosystem to address course management issues, continuing quality assurance and integration of innovative pedagogic designs to regular training provisions. Here the meeting of Bau-ABC training managers, software developers (including LTB developers) and ITB researchers was partly building on the progress in the project DigiProB (see my previous post). Partly it was building on parallel planning of software solutions for course management and quality assurance. The key point was in the shaping of a software ecology that is linked to traditional data management solutions and receives the ‘mature’ results from development platforms. This would be the case with the DigiProB platform that is being used by lecturers in continuing vocational training (CVT) to create integrated project-based learning designs for CVT participants). In such a software ecology the LTB would serve as the participants interface for accessing digital contents and communication channels in such projects. Alongside the case of the DigiProB project we discussed parallel possibilities to work further with the Bau-ABC trainers’ group that has been developing more systematic approach to the theme ‘Health and Safety’ (Arbeitssicherheit und Gesundheitsschutz). In a similar way we discussed the possibilities to use LTB to support context-specific language learning of the Spanish apprentices (in the Mobipro-EU project) and key issues preparing them for their workplace-based training at construction sites. For these themes the Bau-ABC participants and the LTB developers presented recently created or modified LTB stacks as means to support learning in these contexts. In the meeting at the agency for ecological construction work (Agentur) ITB researchers and LTB developers discussed with Thomas Isselhard on the new working perspectives from their point of view (Verden-based organisations and networks focusing on ecological construction work). As we remember, the LTB-use case in which Thomas demonstrated, how he can use the LTB as means to coordinate the work process at a construction site was well received in the workshop for construction companies in September 2016. Now, based on that basic stack we were looking at newer software solutions and mobile apps that can enhance the usability of LTB by craft trade companies. In this discussion a major role was given for construction process-oriented digital tools (Datenlogger) and for possibilities to develop Building Information Modelling (BIM) solutions from the the perspective of craft trades working together. In this context Gilbert Peffer presented the work of CIMNE with portable BIMtables and BIM screens as means to support knowledge sharing during construction processes. In this discussion we could link to a similar session in our previous meeting with Bau-ABC in which we had had a presentation on BIMtable and on a digital tool package (GreenHouse Koffer) for ecological construction work of carpenters. In our discussion in Verden the key point was that the integration of tools and software should support both construction processes and further maintenance. Therefore, the tools and software solutions should take into account planners, craftsmen and clients as the users. Here it is not possible to go into details but this meeting took further steps in planning of new projects with LTB as a key element in such software ecosystem. In the third meeting ITB researchers and LTB developers were discussing with representatives of the company H. In one of my previous blogs I have given a rather detailed picture of a workshop in which we discussed the preliminary findings of a mapping tour that the colleagues had done by visiting different sites of that company. Now in this meeting the colleagues presented a draft report on work flows, support systems, eventual gaps and risk zones and their recommendations. We had a rather detailed discussion – both in terms of situation assessment and possible improvements. Here it is not relevant to give a detailed picture of the discussion. However, at a more general level it is worthwhile to note that the company representatives were looking at a holistic ecosystem for steering work processes, supporting real-time interaction and reporting as well as enhancing knowledge sharing within the company. From the organisational and pedagogic point it was interesting that the company was interested in the potentials of LTB, both from the perspective of process optimisation as well as enhancing the learning processes of apprentices. Moreover, the company was interested in supporting free spaces for exchanges among the apprentices and for organising events to take up their ideas, concerns and wishes. However, with all these interests the company was looking for improvements that could be implemented with the agreement of the staff and with a perspective to integrate different staff members to common processes. I guess this is enough of these meetings. For me this series of discussions was inspiring as I could observe clear steps forward on several fronts. Moreover, this experience gave me a new perspective to ‘digital transformation’. As I now see it, such transformations are not just matters of pushing new technologies upon users (or to substitute a great number of users). Neither can such transformations be characterised as equipping of users with magic tools that radically enhance their powers. Instead, the innovative tools – in order to contribute to digital transformations – have to fit into emerging ecosystems of knowledge processes, steering, sharing and reporting as well as co-design processes in which developers become aware of such requirements. In all these meetings I saw signs of such processes. I am looking forward to observe the next steps.